Most everyone whose profession or hobby requires the use of a quality knife has, at some point or another, heard of Gerber Legendary Blades, often simply referred to as Gerber or Gerber Knives. Gerber’s blades have regularly garnered international praise and have enjoyed endless popularity since their rise in the early 1900s. Whether athlete, hunter, or laborer, a small Gerber knife can mean the difference between a quick, easy job and a difficult, tedious one. Boxes, pelts, rope, and wire ties all become easier when you have the right knife. With this in mind, how can one select the right small Gerber knife for their own use? The answer lies in understanding the models available to you. The Gerber Crucial Tool is one of Gerber’s best small multi-tool knives. Measuring in at a compact 3.5 inches when closed, the Gerber Crucial packs an impressive punch for its size. Two blades, one serrated and one smooth, work in cooperation with a bottle opener, wire cutters, and screwdrivers to provide seemingly limitless flexibility. 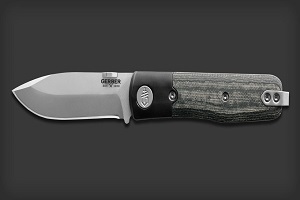 For workers needing to solve unpredictable problems right away, the Gerber Crucial is likely to be a fantastic fit. Forged out of CPM-S30V steel with a polymer-bolstered Black Micarta handle, the Gerber 39 Series Micarta is one of the most impressive small Gerber knives you can find on the market today. 7.6 inches when open, the blade folds down to a compact 3.3 inches, weighing only 3.8 ounces altogether. While this knife is larger while folded open, its simple, easy-to-carry design makes it an obvious choice for those in need of a tough, larger blade that is still lightweight and easy-to-store. With a compact, 1.1 inch, replaceable blade, the Gerber Edge knife is the ideal small knife for warehouse and construction workers. A spring-locked blade makes for lightning-fast blade swap-outs, and an included pocket clip ensures you won’t misplace your blade. At a full length of 6.1 inches, the Gerber Edge knife folds down to an impressive 3.8 inches of length. The grip, available in 3 colors, is rubberized to ensure you have a solid hold on your blade for any difficult cuts. Additionally, the availability of multiple colors and the notably low cost of this blade make it an ideal choice for teams. With ten durable components creatively stacked within a 4.25 inch body, the Gerber Dime Micro Tool is practically unbeatable in size. Pliers, wire cutter, package opener, scissors, tweezers, and more ensure that no matter what challenge you face, you’ll have an answer, all in a package that takes up less room than your car keys. If the knives explored above seem interesting, just wait to see what else is available. Gerber is one of the most storied knife manufacturers in the world, with partnerships all across the globe. White Mountain Knives proudly stocks Gerber products, as well as a number of other knives, like Kershaw Knives, which branched off from the Gerber legacy. Visit White Mountain Knives today to learn just how many options you have!